Hong Kong's Max Lee emerged victorious against Malaysian Ong Beng Hee in an all-Asian finale to the 2014 Hong Kong Football Club International 25 in Hong Kong today. Lee delighted the capacity crowd at the HKFC by securing his first ever PSA World Tour $25k tournament title in a thrilling 3-2, 11-3, 10-12, 8-11, 11-5, 11-6 win against the Malaysian number one. Having already taken out the tournament's number two seed Adrian Grant in the semi-finals, Lee, the World No.32, looked to assert his authority on the contest, the duo's first ever on the PSA World Tour, early and surged to a quick one game lead. But experienced campaigner Ong Beng Hee fought back to take the emphasis and looked to be in a commanding position when ahead 2-1, but the local hope resurged again and held on to take an edgy fifth game 11-6 and seal one of the biggest wins of his career to date. 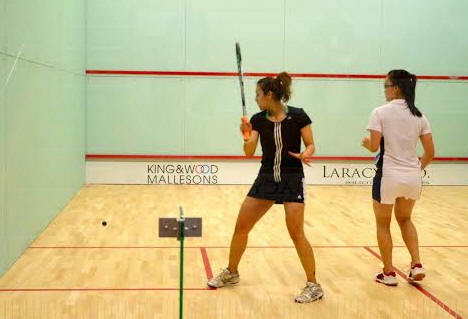 As for the ladies, young US squash star Amanda Sobhy picked up one of the biggest Tour titles of her brief career to date when she defeated Australia's former world number one and world champion Rachael Grinham in straight games in today's final of the HKFC WSA 25 in Hong Kong. The 20-year-old US number one reached the climax of the WSA Silver 25 event at the Hong Kong Football Club in Happy Valley without dropping a game - then crushed 37-year-old Grinham 11-6, 11-2, 11-9 in just 23 minutes to extend her remarkable record in WSA World Tour finals to 12 wins from 13 appearances. A classic match up between one of the long established greats of the women’s game, against one of the most outstanding young players ever on the women’s circuit. Rachael (37) spent 16 months as the women’s world number one and has accumulated 32 WSA titles over her illustrious career. 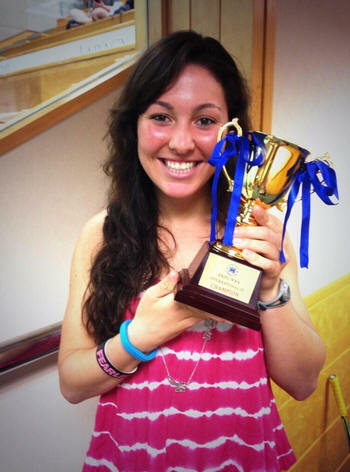 Amanda (20), is the only woman to win 4 WSA titles at the age of 16, which beats even the legendary Nichol David. Having a father (and original coach) who reached the top 30 of the PSA rankings can’t hurt apparently. The first game started steadily with both players trading points. At 5 - all however, Amanda seemed to start to dominate and ran out 11-6. She then took that momentum and dominated the second with the help of some unforced errors from Rachael. She reinforced this with her ability to pick up some of Rachael’s tightest drops, and re-drop with extreme accuracy and claimed the second 11-2. Despite the gulf in the second game, Rachael came out full of fight in the third and in her trade-mark style fought for every point. At 8-9 Amanda appealed for a let when impeded trying to reach a very tight drop shot. When awarded a ”no let” she pointed out “I’ve got long legs”. Sadly the referee remained unmoved. Notwithstanding, she kept her focus and closed out the match 11-9 to win 3-0. After the match, Rachael commented that she simply could not hit the ball tight enough and that allowed Amanda to dominate the game with her own powerful and accurate shots. She then added, “Amanda is a strong player, and is just getting stronger”. Amanda’s reaction to the game was that it was a very fast paced and intensive game. Her concern was to try and keep her focus after winning the second game by such a wide margin as she was fully aware of Rachael’s determination and ability to turn games around. Amanda is still a full time student at Harvard for one more year, but this means she now has Thierry Lincou as her coach. After watching her Ong Beng Hee said “Give her a year and she will be top ten”. I would not be against that. The men’s final was an all Asian affair which underlines the growing strength of Asia in world squash. After the elimination of the top two seeds Adrian Grant and Alistair Walker, Max was narrowly the highest ranked layer left in the draw at a world ranking of 32 against Ong’s of 34. This narrow difference and their 3 and 4 seedings suggested we were in for a very tight final. Interestingly this was their first meeting in a PSA event. Max came out full of determination in the first, picking up everything, and capitalized on Ong’s late match the previous evening. Although the rallies were long and tight, the game score was 11-3. Loosening up, Ong then came right back in the second, and despite Max continuing to retrieve apparently impossible shots, Ong won 12-10. He continued his good form in the third to win 11-8, but max ensured that every point cost Ong a huge effort. By the fourth, this investment was starting to pay off, and finally Ong reached the point where once out of position he was no longer able to fully cover the court. At one point he opened the back door as if to talk to the referee. After a pause he said “I don’t have anything to say – I’m just dying”. Max closed out the fourth 11-5. Clearly exhausted, Ong kept in the rallies and went for attacking shots at every opportunity. However Max was scenting blood, and just kept retrieving, and closed out the 5th 11-6 for a very hard fought 3-2 win and his first 25k+ tournament win of his career which will certainly push up his world ranking. Afterwards Max commented that he knew he was going to have to outrun Ong, and felt prepared to do that. His main problem was Ong’s style which he described as “stop-go” which disrupted his movement pattern. Luckily he had a very strong 1st game, and then in the fourth there were two extremely tough rallies which sapped Ong’s legs. Ong admitted that Max had played the better match, although he felt the late match he played on Friday certainly was not a benefit in facing such a fit opponent. He also commented that he enjoyed playing at the HK Football Club with such a fair and supportive crowd for both players, despite one being the local “favourite”. Two great finals very much enjoyed by the capacity crowd at the HKFC. Max Lee, the home favourite, took on the left-handed Englishman in front of a home crowd. The match started off with some lengthy rallies but Max worked relentlessly to grind out an early lead to get himself to 6-1 up in the first game. Max's line and length seemed too much for Adrian who despite covering the court well made numerous unforced errors. Adrian slowly got back into the game and seemed to gain confidence as the game drew on but despite some new found energy Max pressed on to take the first game 11-6. The second game saw Adrian return to the court looking more composed and focused. He took an early lead to take the game to 6-2 but then a superb recovery shot from Max seemed to spark him back into the game. From that moment on Max took control of the 2nd game and won the next 6 points with a combination of great tenacity and movement around the court. A boast drop from Max game him game ball and then a tight drop volley brought the 2nd game to a close with Max emerging a worthy 11-8 winner. The 3rd game started with both players making a series of errors. The game remained tight initially as both players made a number of unforced errors into the tin and the game reached 4-4. From that moment on Adrian seemed to lose control and Max seized the initiative to the delight of his home crowd as he pressed on to take a 9-4 lead in what was to become the final game. His stroke play and fitness seemed too much for Adrian as Max came through to win the 3rd and final game by 11-5. The second semi-final became a hotly anticipated affair as the crowd began to imagine an all-Hong Kong final tomorrow afternoon. Leo Au emerged fresh from his heroic exploits the previous evening where he conquered Alister Walker who was the tournament's top seed. Ong Beng Hee, the widely favoured Malaysian and tournament number 3 seed, was all that stood in the way of the all-Hong Kong final and he seemed in no real mood to grant that wish to the home crowd. The start of the match was a nervy affair with a number of errors from both players brought the early score to 4-4. Some tight line & length and superb recovery play from both players but notably from Leo took the game to a 9-9 score line. Ong's composure and stroke play improved as the game progressed and just when the crowd thought Ong would close out the first game with ease an uncharacteristic mistake into the tin and then two further unforced errors handed the initiative and the first game to Leo 11-9. Ong returned to the court for the 2nd game in a much more determined and disciplined mood. He surged ahead to take a 7-1 lead with a combination of superb stroke play and he seemed to cover the court in a more controlled manner overall. His pressure continued despite a number of "lets" mid game and Leo appeared to tire early possibly as a result of his tough match the previous evening. The 2nd game saw Ong come through a well-deserved 11-3 which brought the match to one game all and well poised. The 3rd game saw a number of well fought out and battled rallies with both players chasing down everything. Ong's composure and dominance continued to build but Leo's energy appeared relentless as he absorbed all the trickery that Ong threw at him. The game was tight throughout but Ong's tight angled drops and superb stroke variance moved him to an 10-8 game ball where a mid-court drop volley handed him the 3rd game and the overall initiative. 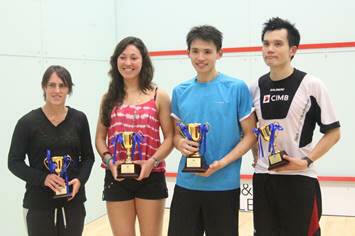 The dream of a Hong Kong final was over for now but the prospect for a fantastic PSA final tomorrow afternoon remains. Max Lee will carry the hopes of the local crowd against Ong Beng Hee which promises to be a very worthy final. Grinham and Sobhy will be meeting for the fourth time on the WSA Tour - with the US star having the edge 2/1 in their head-to-head record after winning their most recent clash, in the semi-finals of the Granite Club Open in Canada in March. An exciting draw between Salma who has already beaten the number 1 and 6 seeds on her way to the final, and Rachael who beat the number 5 seed yesterday. The first game was evenly matched until Rachel took the lead 10-8, closing out the game at 11-8. Game two started with aggressive attacks from Rachael, who rapidly took the lead 6-1. 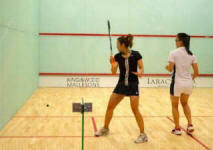 Salma fought back to 9-3 with a series of lovely drop shots, before Rachael took the game 11-4. Rachael stormed into the lead in the third with great shots of varying pace and length. Both players retrieved well, and demonstrated great reach, but Rachael built up a 7-3 lead. Salma fought back again, taking the pace off the ball, but Rachael was too quick, extending her lead to 9-6. A series of great drops took Salma back to 10-10, but a brilliant interception by Rachael took her to 11-10, finally winning out 12-10. Rachael said- ‘it was a tough game; Salma has played really well this week, taking out two seeds. However, I felt I played well; I moved well and picked up shots which I knew I had to do to force the pace and keep the pressure on Salma’. Salma said – ‘I have had a great week here in Hong Kong and at the HKFC, and look forward to playing here again; the tournament has been great. I had two really tough matches, beating Jenny, and taking revenge on Donna after losing to her last week at the British. I surprised myself to be in the semis, in my first International 25. Rachael is very tough to play; today I felt flat after the physical and mental challenges earlier this week. She put me under very tough conditions in the match. I would like to thank Haitham Effat, Mohamed Mossad, my physical coach Hossam Shadad, and the other national coaches Omar Elborolossy, Ahmed Matgany, and also huge thanks to Anna and Ferry for their continued support, and Mazen for the support in this tournament. Also I thank my Mum, I owe her so much’. Another tough semi-final match started with both players very evenly matched, until Amanda started to pile on the pressure with very tight length and drop shots, resulting in a lead of 9-3. She closed out the game at 11-4. Nicolette took an early lead in the second game, but Amanda rapidly levelled the score at 5-5. Both players then played a series of very tight lengths and drops, resulting in a score of 10-10. Amanda closed the game out at 12-10. Nicolette again took an early lead in the third game 4-1, but Amanda fought back to 5-5, with some great interceptions. She then hit a series of winning shots to lead 9-6, closing out the game at 12-6. 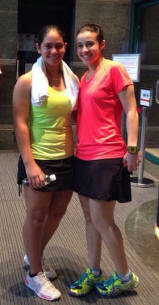 Amanda said: ‘I am happy with how I played; Nicolette is a tough player and we have had some great battles in the past. She did really well in the British last week. I felt I contained her game by staying calm and sticking to my game plan, which I knew I had to do as she has so much energy and is so fit. I am looking forward to another fun match tomorrow’. 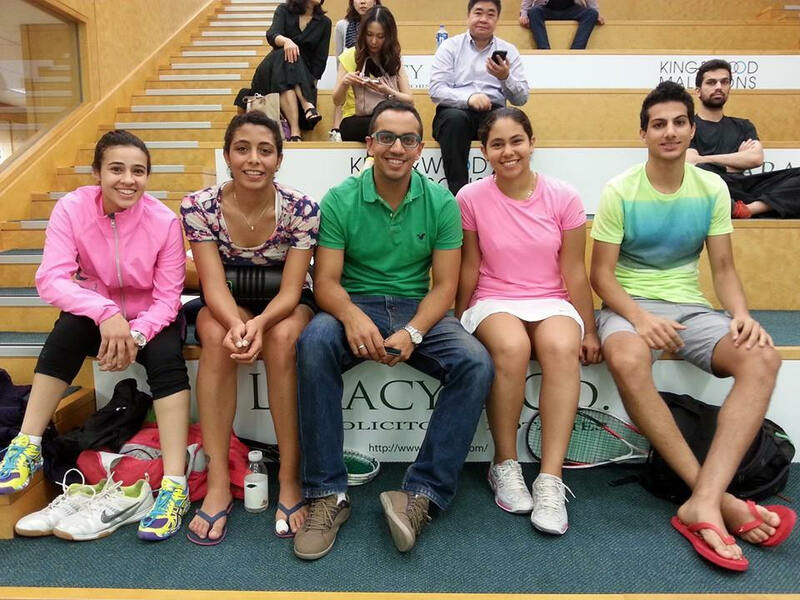 Unseeded Egyptian teenager Salma Hany Ibrahim continued her giant-killing charge through the HKFC WSA 25 field in Hong Kong after taking out a second seed in today's quarter-finals of the WSA Silver 25 squash event at the Hong Kong Football Club in Happy Valley. Just 24 hours after claiming the biggest scalp of her life when she upset England's top seed Jenny Duncalf, the 17-year-old from Alexandria battled for four games to dismiss sixth seed Donna Urquhart. Despite a world ranking difference of 12 places, Hany defeated the Australian world No26 11-4, 8-11, 11-7, 11-9 in 46 minutes to set up a semi-final clash with Urquhart's compatriot Rachael Grinham. Third seed Grinham, a former world number one and world champion, dropped her first game in the tournament when she beat fifth seed Joey Chan 11-3, 11-9, 3-11, 11-9, thereby ending home interest in the championship. The other semi will be the encounter predicted by the draw - between second seed Amanda Sobhy and No4 seed Nicolette Fernandes. US number one Sobhy, a student at Harvard University, took just 26 minutes to overcome Egypt's No7 seed Heba El Torky 11-5, 11-1, 11-4. Guyana star Fernandes had an altogether different route to her anticipated semi - being made to fight back from two games down by Delia Arnold before beating the Malaysian qualifier 2-11, 8-11, 11-7, 11-3, 11-5 in an 86-minute marathon. The WSA quarter-final between Fernandez (GUY) ranked 19 versus Arnold (MAS) started very well for Arnold. It looked as it may be the second women’s upset in the tournament when Arnold was up 2-0 (11-2, 11-8) in what was a somewhat one sided affair. Into the 3rd game and Fernandez started to play the match, one might say. She took the 3rd 11-7 and 4th 11-3 to take the match to a final game and decider. It was, again, top quality squash with aggressive shots, long rallies, questionable calls by the referee and an intensity rarely seen the HKFC. It was again wonderful squash for the spectators. Fernandez had overcame the poor start and took the final game 11-5, in a match that lasted 86 minutes. A well-deserved applause to both players was only in order. Arnold who came through the qualification round put up a good fight, challenged and played for her chance. International squash will surely see more to her in future. 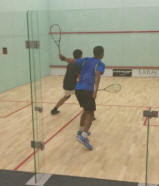 Next up was then Sobhy (US) and El Torky, ranked 15 and 28 respectively. 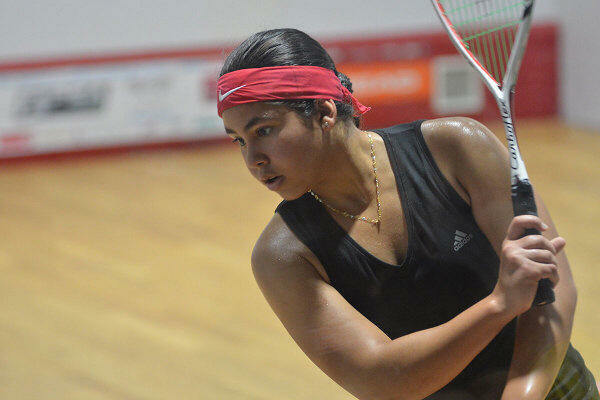 Clearly Sobhy controlled the game right from the beginning with good tight shots, and perseverance to win. She had the power to play at a faster pace than El Torky could handle. A reasonably easy 3-0 (11-5, 11-1, 11-4) win to see her through to the semi-final tomorrow. The second day of the Hong Kong WSA and PSA tournament gave us another big day of squash in the quarter finals. 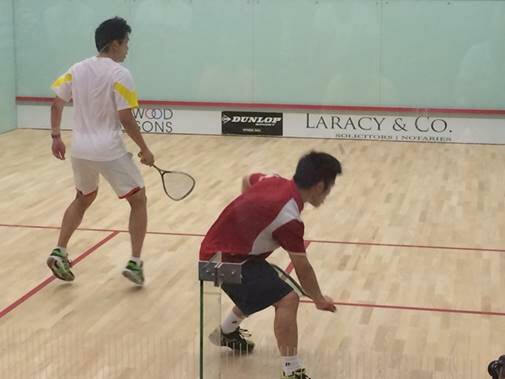 Hong Kong's own top player, Max Lee (KHG) was up against Mazen Hesham (EGY), PSA ranked respectively 33 and 38. It was a game best described as fast & furious. Max, perhaps with the better calm game plan versus Mazen, the young fast player seeking the kill shots. It was tight shots all the way, wonderful pick-ups and rallies that went on and on, corner to corner. Max taking the game 11-7. The second game picked up the intensity and pace by both players. it is fair to say, both played their best. Max took the game 12-10, to take the lead,2-0. As the third game started, it was clear the game grew in intensity and quality. It was fast paced, intense, good corner shots, great pick-ups, and unsurprisingly, a fair amount of questioning the referee. Long rallies and an immense running regime made the third game, in particular, and the match in general a treat for the spectators. Both players fought well and the score line was 9-9. Then we had what arguably was the rally of the match. Max took the game 11-9, and the match 3-0. While the score line is clear, the match could have gone either way. Perhaps Max had slightly more luck, or the home court advantage player. 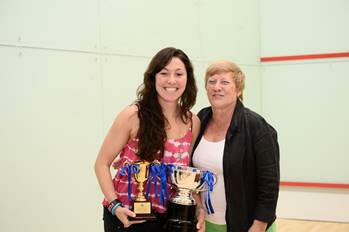 Nevertheless, a great squash game with two very talented players! Next quarter was Adrian Grant (ENG) against Adnan (Mas), ranked 20 and 34 respectively. From the start it was clear Adrian was in control and had the better shots, and the better fitness. It was a 3-0 win to Adrian and he is on to the semi -final tomorrow. Finally, the match of the day was the much anticipated match with Hong Kong's own Leo Au (HKG) and Alister Walker (ENG), ranked 34 and 20 respectively. It was a tense match. Alister took the first game 11-6, but Leo was only warming up and got back into the match taking the second 11.9. 1-1 in games. Ali fought back, and dug deep to get the edge and took the game 11-9. 2-1 to Ali. It was clear that this was a match of experience versus perseverance. Leo played well, few mistakes and played the ball back from all corners, changing the pace and generally appeared to get into the match short by shot, step by step, rally by rally. Leo took the 4th game by 11-8. The crowd was going wild and following every shot vigorously. Ali, a HKFC long time darling versus Leo the local HK kid. It was hard for many to pick a side. The fifth and final game, and Leo, the young blood came out firing. In no time, he took it to 8-1 and from there it was only a matter of time. Tiredness, fitness, friendly discussions with the quality referring and crowd support might have had an impact. Leo took the game and the match 3-2, in 75 minutes. Ben Pawlyn, a long time squash aficionado, watched the game with a few pints and enthusiastically summed up the game with 'I'd say it was damn fine game'. We could not agree more. Leo after cooling down took time and comment and was happy with the match, He said' 'I’d played my chances and tried to get the ball back to him, and not make mistakes'. Asked what he attributed the win, he said his body condition and fitness was the reason for the difference today from two year back, when he played Ali. 'I am able to play slower and change the pace of the game, and was able to get to the ball and get them back' When asked to the relatively quick 5th game, Leo said 'I was able to keep the pace and get the ball back and just play my own game'. A tired and visibly pleased Leo is looking forward to the tomorrow game. 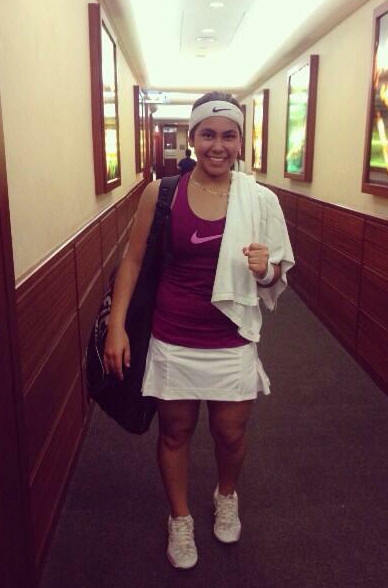 Egyptian teenager Salma Hany Ibrahim scored the biggest Tour victory of her life when she upset England's top seed Jenny Duncalf, a former world No2, in today's first round of the HKFC WSA 25 at the Hong Kong Football Club in Happy Valley, Hong Kong. Unseeded, the 17-year-old from Alexandria recovered from 2/1 down to topple world No12 Duncalf 11-4, 5-11, 3-11, 11-4, 11-2 in 45 minutes. Hany, ranked 38 in the world, now faces Donna Urquhart after the sixth seed from Australia despatched US veteran Latasha Khan 11-4, 11-8, 12-10. There was a further upset on the opening day when Malaysian Delia Arnold became the only qualifier to make the last eight after ousting Aisling Blake, the No8 seed from Ireland, 11-6, 12-14, 11-6, 11-7 in 65 minutes. Arnold, the 28-year-old world No40 from Selangor, now faces Nicolette Fernandes, the No4 seed from Guyana who beat Welsh qualifier Deon Saffery 11-1, 11-8, 11-8. Fifth seed Joey Chan carries home interest into the quarter-finals after fighting back from a game down to beat New Zealand qualifier Kylie Lindsay 10-12, 11-7, 11-4, 11-2. The 26-year-old Hong Kong number two, ranked 24 in the world, next takes on experienced Australian Rachael Grinham. The 37-year-old former world No1 from Queensland, already playing her 10th Tour event of the year, defeated Hong Kong wild card Carmen Lee 11-7, 11-8, 11-8. All eight seeds survived during the opening round of the 2014 Hong Kong Football Club PSA International 25 tournament in Hong Kong. Number one seed Alister Walker, the Botswanan Sportsman Of The Year, began his title tilt in composed fashion taking out in-form South African Wild Card Shaun Le Roux, who has won three of his last four tournaments, 11-9, 2-11, 11-8, 11-9. England's Adrian Grant, the number two seed, was commanding as he saw off Malaysian Ivan Yuen in just 40-minutes while local duo Max Lee and Leo Au also impressed, coming through against Nasir Iqbal and Rex Hendrick, respectively to ensure home hopes remain strong going into the second round. 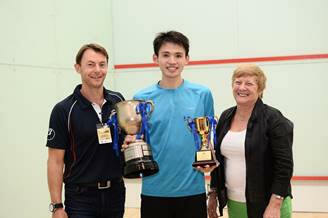 Elsewhere there were wins for Ong Beng Hee, Nafizwan Adnan, Mazen Hesham and Henrik Mustonen. Today, we saw a number of great and exciting squash matches. First up was the qualifier and last years HKFC Pros's exciting outsider, Rex Hendrick (AUS) up against the local favourite Leo Au (HK). It was a squash match of immense tension and great quality. Long rallies, straight drives and high lobs. Corner to corner, front to front, boast to back corner. We witnessed the very best a squash game can give us. Leo took the first game 11-6. In the second game, Rex was putting up a serious fight. Again, no short cuts, and true to nature, both players played to win with long and enduring rallies, tight drops, accurate corner shots, few lets and even fewer strokes. 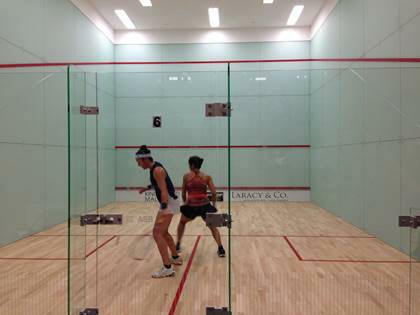 The second game was a beauty to watch for squash lovers, and Leo took the game 11-7. In the third game fatigue started to makes its mark; understandably so. Again we witnessed more beautiful squash and tight shots, but arguable with a few errors appearing here and there - both players even began to find the tin now. Leo took it the game 11-7; winning the match 3-0. Thanks to both Leo and Rex for giving us a great game to experience from the spectator stands. The next game of the evening was the other local favourite Carmen Lee, still an active member of the Hong Kong Football Club, who was up against Rachel Grinham (AUS). It was an exciting match with two different styles of play. Perhaps the match can be best described as the technique vs the muscle & hustle. While Carmen, perhaps had the better technique in her shots, and running down shots, clearly Rachel had the better hustle for the wins. The first game went to Rachel, 11-7, quite quickly. In the second game, Carmen showed her fighting spirit. She went down 5-1 in almost no time, and the she dug d deep to get back in the match. She did so beautifully and went from 5-1 down to get back to 7-7, only then to make tow unforced errors. At 7-9 to Rachel, Carmen hit a likely winner out of court, and eventually lost the game 11-8. On to the third game, and Rachel came out on fire. In no time she was up 7-0, before Carmen found her feet again. Carmen, however, fought heroically and came back to 9-6. It was beautiful squash all the way. However Rachel had the better finish and won the third game 11-7. 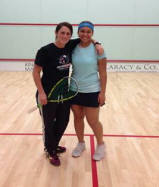 Thanks to both Carmen and Rachel for a great game of squash! First seed Delia Arnold from Malaysia won in straight sets (11-6, 11-5, 11-7) against Ho Ka-Wing of Hong Kong. Delia seemed very comfortable right from the first point and was hitting the cross courts and parallels with great precision and success. Ho, on the other hand, was hesitant and seemed restricted in her stroke play. She took time to open up but by that time she was already trailing 5 points. The initial points difference seemed too high for Ho to pose any threat to Delia when she started scoring few points on each hand over. The first set ended 11-6 in Delia's favour without breaking much sweat. The second set was like a replay of the first one with Delia only more focused this time. Ho showed her good game in spurts. Delia had already started understanding Ho's placements which resulted in some long rallies. Ho was showing signs of tiredness by this time. Delia finished off the second set 11-5 on her serve and Ho hitting the board in return. The third set ran longer than the first two with Ho trying to fight her way back into the match and Delia was making Ho move to all four corners of the court while herself just moving around the center. Ho took early lead in the set showing her fighting spirit but could not hold on to it. Delia overcame the point difference and then gained the lead in just two hand overs. If only Ho would have shown this game from the first set, Delia might have been worked up in subsequent sets giving some hope to Ho. It was simply not Ho's day and she lost the last set 7-11 and the match. Throughout the match, players were very respectful of each other and scored high on fair play. Delia obviously looked relaxed in the post match conversation. On being asked if she found the match easy. She replied that Ho did give her a good challenge and she was only focusing on a point at a time for most of the game. In the third set when she knew that match is in her control, did she start placing and conserve her energy for the next day. Overall it was an easy win for Delia with Ho showing flashes of good stroke play. Ho will get to learn a lot from this game. The first men’s qualifier match of the 2014 HKFC PSA International 25 on the newly renovated show court 7 featured one of Hong Kong’s local heroes, HKFC’s Phil Head against Muhammad Saqib Yousaf of Pakistan. The unranked Head with the home court advantage who's last appearance on the tour over 10 years ago was feeling in good spirits, trading his youth for experience with his much younger world ranked 128 opponent Muhammad with his sights on the main draw. The first game, both players trading points early on with Head going 5-3 up before Muhammad began to get into his stride, taking the ball early, volleying and not giving Head much time to recover between shots. The younger player having a little more in the tank left to close out the first game 11-7. The second game and Muhammad taking an early lead of 4-2, Head fighting back to 6-6 before Muhammad began to employ the front court tickle boast with great success catching Head stranded on the side wall on more than one occasion. After fighting hard to stay in contention Head began to lose his grip on Muhammad as he pulled away to win the second 11-8. The third game and Head by this point perhaps feeling tiredness in his legs as he tried to stay in contention but Muhammad the younger and fitter of the two making use of his superior fitness as he continued to move Head around the court and hit winners with great purpose taking a strong 7-3 lead. Both players by this point happy to trade winners as the match reached it’s conclusion 11-6 and 3-0 to Muhammad 11/7, 11/8, 11/6. Both players leaving happy with their performance. Muhammad with a solid performance and deservedly progressing into the next round we he is likely to face a stiffer test. Head “I was in it for the first two games, but in the third the legs began to go as Muhammad began to play his impressive tickle boast and hit winners with great accuracy. Courts were great and very true”.